Turtle Bay View is one of the best properties listed in Cyprus44 property reviews. The management behind Turtle Bay Properties first began selling properties in Marbella, Spain, over 20 years ago. They now sell homes in North Cyprus, and as far afield as Brazil. They joined forces with the North Cyprus developer Savayon Developers in 2004, and their impressive sales portfolio includes the various Turtle Bay branded sites, Nature Bay Village and the Turquoise Bay Golf and Spa Residence. 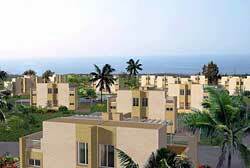 Turtle Bay View is a gated development of 48 town houses with both sea and mountain views. With a contemporary design and good use of glass windows to maximise the views, these houses come with their own covered parking space and small garden. Located near Esentepe and within easy reach of the new golf course, the Turtle Bay View townhouses will certainly suit the enthusiastic golfer who wants to spend more time on the course than at home during the day. However, even the keenest golfer will be happy to return for a barbecue on his (or her) own private roof terrace, and there is even a sink included, so whoever does the washing up gets a fabulous view at the same time! The amenities on the kite-shaped site include a central communal swimming pool, tennis court and snack bar, plus a reception area and resident caretaker, useful services for any investment property or holiday home you wish to rent out when not in North Cyprus yourself. The beaches are a 2km drive away, and Turtle Bay View is only 16km for the pretty harbour town of Kyrenia, with its excellent restaurants. You can also dine at the Korineum Golf and Country Club restaurant too, only five minutes' drive away. Turtle Bay View town houses certainly make the most of the views by placing the two bedrooms and one bathroom on the ground floor, whilst the living room and galley kitchen are on the first floor, plus a small WC. The roof terrace is certainly a great feature, and there is also a ground floor terrace leading to the garden. Each townhouse comes with modest features as standard, such a ceramic floor tiles, double-glazed PVC windows (mot aluminium), and air conditioning pipe work only in the living area and bedroom. With only 45sqm of living space on each floor, the Turtle Bay View townhouses are certainly on the small side for North Cyprus properties, but are very much designed for those who prefer to be outdoors most of the time. Comparable in size, however, to modern starter home housing in the UK, these town houses may also attract local working rental clients, as well as holiday makers. Turtle Bay Village, here we come! Turtle Bay Village Owners Forum? Any good places to eat close to Turtle Bay Village ? This web page is served on 19 April 2019 at 23:41:26.